When Vesuvius erupted on August 24, 79 AD, it famously engulfed the Roman town of Pompeii and, less famously, the richer town of Herculaneum. Both places sat under 50-60 feet of volcanic ash until they were rediscovered in 1748. In contrast to Pompeii, the hot gas and rock flow preserved Herculaneum’s organic-based objects, such as wooden roofs, beds, doors, and food. 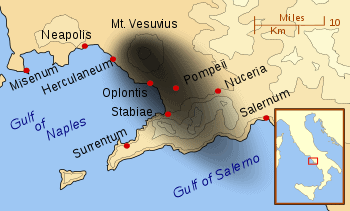 Until recently, it was believed that almost all of Herculaneum’s inhabitants had been able to evacuate. However, in the 1980’s, some 300 skeletons were surprisingly discovered along the seashore. This was an incredible archaeological discovery and would lead to greater insight into the lives of the Romans. However, the dig ran into serious financial difficulties. Fortunately, one American diplomat was able to get the National Geographic Society involved. 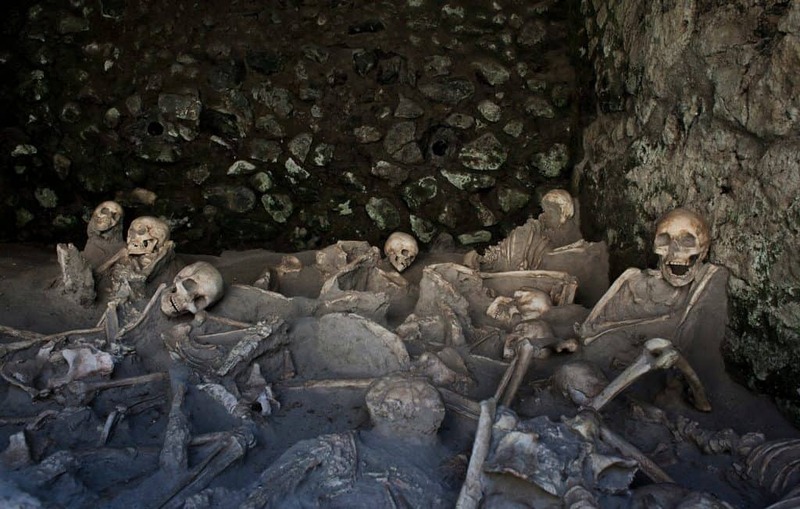 Herculaneum is now a UNESCO World Heritage Site. Walter J. Silva recalls his time in Naples as a political-military officer and discusses the chance encounter that led to his involvement and the sad loss of one of the site’s more unique finds. Charles Stuart Kennedy interviewed Silva beginning in January 1995. This September 2016 New York Times article explains how a breakthrough in technology could help archaeologists finally read some of the charred manuscripts destroyed at Herculaneum. SILVA: During this time too I had some good friends who were in the archaeological business at the museum in Naples. I loved that museum and I got to know some of these people rather well. I had been to Pompeii and Herculaneum several times. It was a great place to take visitors. They had gone farther towards the ocean and they had actually finally dug down to the original beach level. And there, in alcoves built into what had been the city wall, alcoves that had been used to shelter fishing boats, they found all these skeletons. So, I told him okay, I would make some phone calls and see what I could find. I had met one guy from the National Geographic some time before in the company of Jim Creagan…. At a party sometime in the past I had met this guy from the Geographic but I had forgotten his name. Jim Creagan had been there, so I called him and asked if he remembered this guy’s name. He did. So I called the fellow, Lou Mazzatenta, told him what had happened and suggested it would be nice if the Geographic would take on the godfather role in helping to continue this thing. He said he would take it up with his superiors. Next thing I know I had a call from Gilbert Grosvenor, who was then the No. 1 at the magazine and the organization as well as the grandson of the original founder. He said he was going to send somebody over there to take a look, see if it was worthwhile. So they sent a guy over. Meanwhile I had talked to Maxwell Rabb, the Ambassador to Italy at the time, about these conversations. When I told him Grosvenor had called, he told me he wanted to be involved if anything came of it. Naturally, I assured him I would keep him informed. The magazine sent a photographer and writer and turned out an initial story on the find. 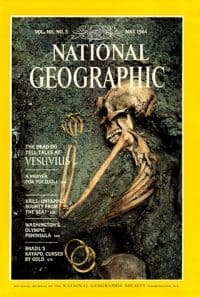 Then they agreed to fund a substantial portion of the work and to send a paleoanthropologist to examine the skeletons, to re-articulate the skeletons, and write up the condition and pathology of the remains. They sent a lady named Sarah Bisel, who had been trained under a man named Angel at the Smithsonian. She was good. Anyway, they agreed to send her, they gave her a grant for a year, and then they provided some funds for other things. Rabb was not very happy about all this. It was getting a lot of coverage in the press and television and he would have rather had it happen in Rome. But I invited him down and he actually came to Naples, paid a visit to the site, and got his picture in the paper. But it was obvious Max would have preferred to be covered by the Geographic. At any rate, the Geographic was very pleased initially, so they ran a second article on the subject of Herculaneum. They also did a television thing on the dig, very well done by Joe Seamans of WQED in Pittsburgh, whose father was the Seamans of MIT. Small world that these people move in. Anyway, it was a pretty good thing and they decided that a group would come over to look at the work that they had been paying for. They came, the Board of Trustees, and the editor of the magazine, the people who had done some of the writing, and Gil Grosvenor. They all came over. They intended to return by way of a brief stop in Rome, so I called Rabb and suggested that he ought to have a reception for them and invite the important people of the government to it. This was a major thing for Italy! The National Geographic can make a tourist mecca of a historical site, so he agreed, reluctantly strangely enough. There was a rather nice reception to which most of the ministers came…. The Geographic thing lasted a long, long time. Unfortunately, after two or three years, the Society walked away from it. In the meanwhile Sarah Bisel (pictured) did a fantastic job in assembling, preserving, and interpreting the bones. She had discovered how many children women had had, what they died from, the diseases they had. One of the skeletons on the beach was a Roman solider who still had his sword with him. The ash had even preserved bits and pieces of leather from his sandals. He had his tool bag on his back because most Roman soldiers were also specialized craftsmen and carried their tools with them. This guy had been some kind of carpenter because he had his tools with him, as though he was trying to escape. Sara found out that the reason he had been in Herculaneum was probably that he had been furloughed for a serious wound he had received. She found out that he had a broken leg with evidence of fistulas and pus. The leg had never healed well and since he was not fit for regular service, he had been sent to Herculaneum. They found jewelry on a woman that made it apparent she was wealthy. All this kind of stuff kept coming up. Then they found the boat. 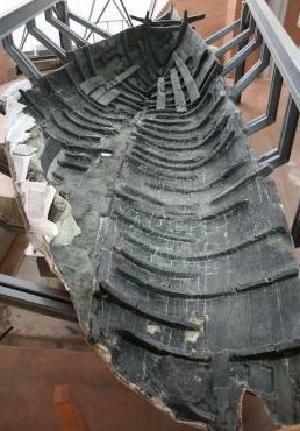 As they were digging beyond the beach they found a wooden boat in a remarkable state of preservation. It was intact but completely turned to charcoal; it had been enveloped by hot ash so it had completely carbonized and simultaneously preserved in the hardening ash. It was virtually intact, with a mast, evidence of shroud lines and sails, and indications as to how the mast was stepped. They gave this man a grant to come over to study the boat to try to do something about preserving it. I forget his name, but he was a charming guy who had barely finished high school and had gone on to be an electrician for 20 or 30 years. During his t ime as an electrician, he developed a hobby of boats that involved building, first model boats, then big boats, and then he got interested in boats generally and started studying them in museums. And he became, without an educational background, one of the world’s great experts on ancient boats. He went to Cyprus for that boat; he went to Scandinavia for the Viking boat, all that sort of thing. He was thrilled with the boat; he said it would provide information for the first time on how these little boats were rigged in Roman times. Apparently no one knew how they rigged their sails. There were a lot of discussions, a little digging, until they eventually found a helmsman with an oar still in his hand underneath the boat. It had turned over in the waves, apparently, and he had been killed trying to escape. It was all very exciting stuff, but the question was how do you preserve the boat and get it out of the matrix of solidified ash that held it? Being the kind of person he was, our man came up with a brilliant solution. You got gallons and gallons of Elmer’s glue and just painted this whole charcoal boat in Elmer’s glue. You kept applying the glue until you got a solidified boat. Then he would take it apart, bring it to shore, and reassemble at the museum. In the process we would also learn how it was built. The Italians didn’t like that idea. (By then, it was seen in Italian academia that there was a lot of mileage to be made in Herculaneum and foreigners ought to be pushed out of the game.) They thought the Elmer’s Glue notion was too simple. All sorts of university professors from Rome, Pisa, and Genoa came to look at the boat, especially from the traditional maritime states such as Venice Genoa, and Pisa. It seems special units at the universities in the maritime states deal with boats. They thought the Elmer’s glue idea was ridiculous and said the hell with it; we’re going to do it ourselves. When our friend from the University of Texas was away, they took a forklift, dug under the boat, and lifted it up. Of course they destroyed the boat. Not much is left except a few nails and a couple of brass fittings. After that the Geographic left quietly.